Nanostructures continue to fascinate the world with their unique physicochemical functional properties, necessary for applications in various fields such as sensors, energy harvesters, catalysts, storage devices, etc. Carbon is considered a rich family for nanoscale systems, and it exhibits extensive functionalities which depend on its structural and functional arrangements. But not all members of the carbon family have become relevant for application in modern society. The most promising research has focused on two-dimensional (2D) graphene-based systems, with an exponentially increasing number of publications since 2005. After the demonstration of the physical functionality of the graphene-based systems, the chemical functionality of graphene, and the different synthesis processes, has also become a focus for attention . There are different aspects to the role of graphene, and the functionalities it demonstrates. One aspect, is the attention graphene draws to the potential for the functional properties of graphene to be active alongside other functional systems. In our group, we mainly focus on electrospinning functional polymeric and inorganic nanofibers/nanowebs. Utilizing the advantage of the synthesis process for the production of membranes with 1D nanostructural features with designer surface functionality and architecture allow us to use them in environmental remediation processes to remove organic waste and heavy metal pollutants [2,3]. Thanks to the surface functional groups, high surface area, porous nature and typical architecture, electrospun polymeric nanofibers were effectively utilized as a platform for adsorbing the pollutants and used as filters. As an effective adsorbent, graphene has been widely investigated for the effective removal of pollutants from the wastewater . Coupling graphene-based nanostructures with electrospun polymeric nanofibers represents a fundamental step for improving the effective adsorptive behavior of our polymeric membranes. In particular, chemically synthesized reduced graphene oxides having the sp2–sp3 carbon functionality were successfully synthesized by the modified hummers method followed by chemical reduction. By adopting the chemical functionality for the electrospun nanofibers, a reduced graphene oxide decorated polymeric nanofiber based hybrid form of membranes have been synthesized as an effective adsorbent. The reduced form of graphene oxide not plays a role as an effective absorbent, but it also acts toward improving the stability of the polymeric membranes. Through the self-assembly process, the patterning of the micro-nano structure was constructed through the interaction of covalent, metallic, hydrogen and coordination bonds over the functional surface with the hydroxyl, epoxy, and carboxyl functional groups . By modifying the polymers and including some metal nanostructures within the graphene functionality may lead to the development of complex hybrid system for advanced applicability in fields such as catalyst, electronics, sensing, storage based devices, etc. . Constructing the graphene-based systems with polymeric membranes having unique architecture and functionality will provide innovation in materials science in related fields [7,8]. Research into graphene-polymeric based membranes by tuning its structural and functional properties will facilitate new opportunities on these hierarchical platforms. The objective is to play a role on the external skin of the polymeric nanofibers to enhance it structural and functional properties by introducing thin layered graphene oxide flakes to improve the absorption behavior, and to modulate the mechanical and electronic properties and more. The cover image of this issue shows a scanning electron microscopy image of a polymeric nanofiber decorated with reduced graphene oxide nanoflakes fabricated from the combination of an electrospinning and a surface functionalization process. The strange decoration of graphene oxide flakes on the polymeric nanofiber is based on the functional attachment of graphene oxide flakes with the polymeric surface through the interaction of functional groups followed by the localized heating of the air blown to dry the polymeric membrane. The hierarchical structure was made by utilizing the electrospun polymeric nanofibers as a template for the decoration of graphene oxide flakes. 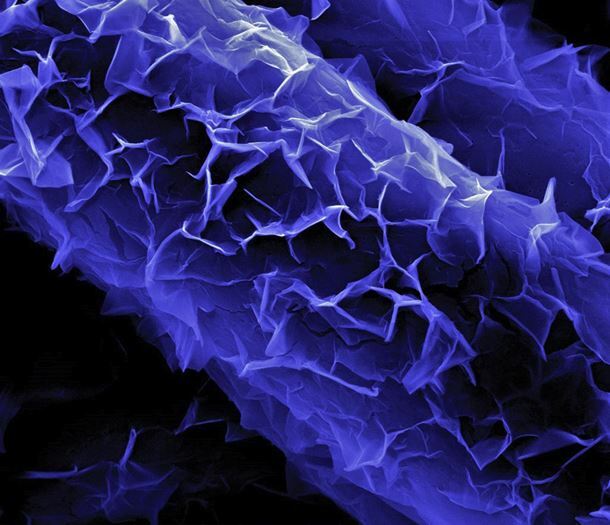 The goal was to decorate the graphene oxide on the polymeric fibers, but as one can see, the graphene oxide appears to be wrapped around the polymeric fiber, like the wrapping of isolated petals around a stem. The unique arrangement is of interest for the effective adsorption of pollutants from the wastewater. The hierarchical arrangement of reduced graphene oxide-polymeric membrane based hybrid systems have initiated discussion on the development of environmental remediation systems, and we believe that these hierarchical platforms can play a key role in multifunctional application in the fields of electronics, catalysts, and sensors.